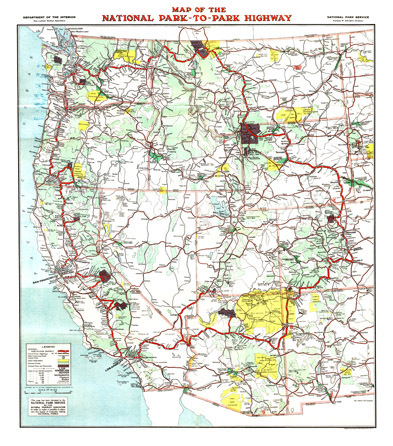 The National Park to Park Highway connects the national parks of the western U.S. in a great circle. This road was supported and promoted by the Park Service, and by the National Park to Park Association. This road had, and still has, much tourist potential. Use this board to discuss America's western national parks and the scenic road connecting them. Are their maps for this highway? We watched this on PBS last night and it looks like a great trip. If you look at the maps and books section of this site, you'll see a guide book called The Playground Trail by Lee and Jane Whitely. It does not have a lot of modern maps to find the old road, but does have several of the old auto trail maps of the highway. Part of the NPtoP was the Yellowstone Highway (not Trail), and there is a book by Lee Whitely on that as well. It's described on the same maps and books page. One of the things I'd like to do is make a road guide, and to make a road trip (or several) along the NPtoPH. There is one section fairly well mapped and described, and that's the National Old Trails Road section from Los Angeles, CA to Holbrook, AZ. Most of that became Route 66. 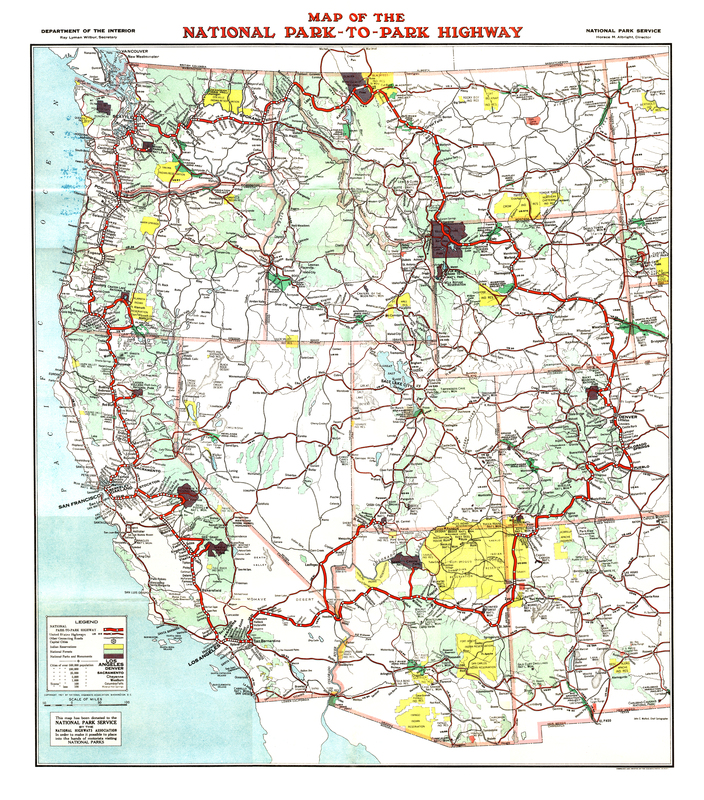 In the guidebooks, you want to look for the National Old Trails Road or 1926 Route 66 alignments. For the long Arizona section, I would recommend Route 66 Across Arizona : A Comprehensive Two-Way Guide for Touring Route 66, but it seems that Amazon is no longer carrying it. For the whole section of 66 along the Highway, your best bet is Jerry McClanahan's EZ66 Guide for Travellers. 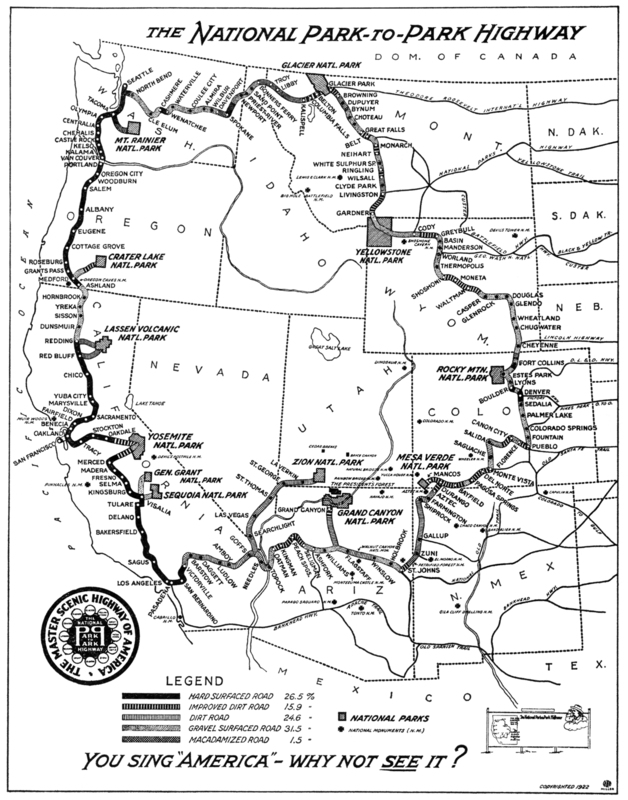 You can find links and info on Route 66 books and maps on my Recommended Route 66 Resources. I will have a page on the Highway on this site, but as always, I'm doing all this a little at a time. My husband and I just finished watching a special on this road (probably the same show mentioned in the previous post) and would like to know if there is any further information available on this road. Since the most recent post is over three years old we thought there might be maps available now. Thanks for posting and joining the forum. I think my last post was 3 months old, not three years old. As far as I know, there are no detailed maps of the National Park to Park Highway as yet. If someone is going to do it, it will probably be me. The Playground Trail book I mention does have a reproduction of pages from a rough early guide book. I have an original copy, but there's not much detail there, just the general route. I'm actually working on a new set of highway description guides to outline what roads can be taken to approximate as closely as possible all the old auto trails. I was just working on the Theodore Roosevelt International Highway (mostly US 2). When I get the National Park to Park done, I'll post it here. I do have the bigger towns, but not the smaller ones or the highway numbers. That's pretty close to the National Park to Park. The Zion trip was a spur off the circuit. 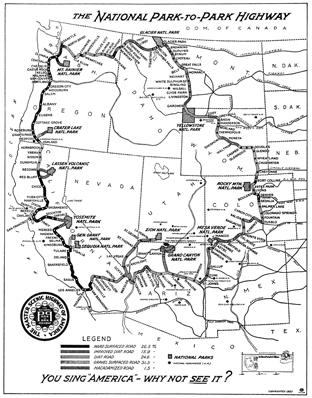 The NPtoP followed the National Old Trails Road to St. Johns and up through Zuñi Pueblo. Some of your route could be nice and scenic though. In fact, my family did routes very similar to yours on two separate trips.